Hiccups, medically known as Singultus occur when the diaphragm and the larynx suddenly contract involuntarily at the same time, closing the glottis and preventing the flow of air. What are the causes of hiccups? Take a deep breath. Hold your nose and take a deep breath for as long as possible. Breathe into a paper bag. Take a paper bag and breathe into it. Don’t cover your head with the bag. Massage the top of your mouth. Do this carefully with the help of a cotton swab. If you have a decent gag reflex and a steady hand you can also try massaging the back of your throat and stimulate the cone shaped tissue called uvula. Eat a spoonful of sugar. This is also another excuse to eat more sugar. Sugar is commonly suggested because of its sticky nature. Sticky foods are known to stimulate the vagus muscle and relive hiccups. Cough/burp or sneeze. 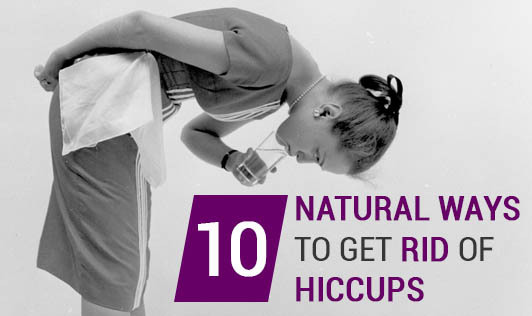 If you manage to do any one of these actions, your hiccups may go away. This is because these actions constrict the diaphragm which indirectly stops hiccups. Apply pressure on your nose and swallow. Pinch your nose and simultaneously swallow. Stick your finger in your ear. The branches of the vagus muscle reach way into your ears and they can be stimulated by your fingers. Just make sure you do not push your fingers in too far or too hard. Try the fetal position. Gently compress your chest by leaning forward and get your knees close to your chest. Hug them for a couple of minutes. Enjoy a slice of lemon. Eat a small slice of lemon. Place it on your tongue for a while before chewing. Burp. Many people have aerated drinks and burp, to get rid of their hiccups. However, some physicians warn that aerated drinks can also trigger hiccups.